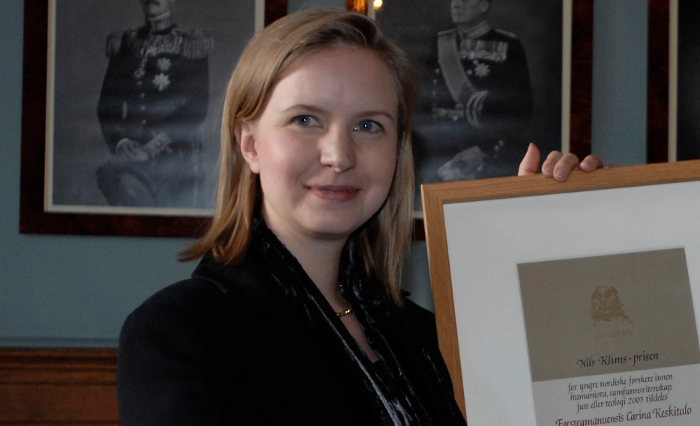 The Nils Klim Prize for 2007 was awarded to the Swedish social scientist Carina Keskitalo. "Carina Keskitalo, born in 1974, is Associate Professor at the Department of Political Science at Umeå University in Sweden. She obtained a doctoral degree already in 2002 from the University of Lapland in Finland. Although Keskitalo is young in the profession, she has been a visiting research fellow at universities in Europe and in the US. Her multidisciplinary approach to issues of relevance for the Arctic regions has by its conceptual clarity and innovative character made her work recognized internationally. In her doctoral thesis, Constructing 'the Arctic': Discourses of International Region-Building, Keskitalo shows a deep understanding of the perceptions of the Arctic regions in the past and in the present. According to Keskitalo's critical view, the Arctic region discourse of today can be traced back to the late 19th century ideas of the far north, describing such regions in Canada, USA, the Nordic countries and Russia as purely environmental areas with mainly traditional indigenous subsistence livelihoods. This narrow focus, created from the outside by researchers and politicians who were attracted by the darkness and exoticism of the North rather than by its character as a modern place of living, has developed a kind of "Arctic orientalism" which obscures the economic element and current problems in the regions. Keskitalo's thesis, which was published in a revised version by Routledge in 2004, has been extensively quoted and included as course literature in Arctic Studies throughout the world. For her post-doctoral studies, Keskitalo has chosen a different and even more fruitful direction - a sign indeed of her versatility and ability to branch out into new research areas. Within the frame of a number of different research projects, she has focused on the human dimensions of global environmental change. By means of in-depth interviews she has studied the local perceptions of environmental resource use in the European Arctic regions, thus revealing how multiple impacts, including globalisation and climate change, affect the local actors. Keskitalo's work shows that vulnerability is determined by the interrelations between both public and private decision-makers at several levels, from the local to the international, and that adaptation to change must include cross-level and cross-sectorial communication and feedback. Her studies have been recognized internationally as a novel approach to the field. While much research on vulnerability has been rather brief and mainly conceptual, Keskitalo has developed a methodology and formulated a framework which is suited for multi-country and multi-sector studies. Her research has most recently been extended to a large, interdisciplinary project, which was top-ranked and funded by a major Swedish council. Keskitalo has displayed an impressive readiness to adopt new challenging interdisciplinary approaches and her works have been published internationally. " Associate Professor Carina Keskitalo receives Nils Klim Prize 2007 from State secretary Jens Revold, Ministry of Education and Research. Photo: Scanpix/Marit Hommedal. Carina Keskitalo, Associate Professor at the Institute for cultural geography at Umeå university.